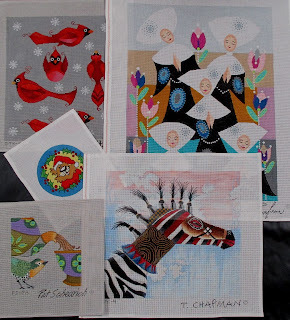 Here are a few of the new canvases we are bringing to the Spring Needlepoint Show. The rest will be on the NEW page of our website - www.tapestryfair.com. Tapestry Fair has been producing handpainted needlepoint canvases for independant needlework shops since 1973. This blog is a preview of new designs and models we are currently stitching.